Everyone is sick and the flu shot is only 10% effective this year. But great news, my Naturopathic Flu Prevent Regiment respects and bolsters your bodies innate healing and immune defense capabilities and is 100% additive free! Let’s get the basics out of the way….Sleep, Diet, Exercise, Sunshine, Fresh Air, Hygiene, Hydration, Stress Management, Sweating, and Deep Breathing are daily necessitities in this hectic world. Make sure you are getting proper sleep every day, ‘eat the rainbow’ and avoid processed foods, wash your hands, stay hydrated, exercise daily, get out in the sun and fresh air and control your stress. Sweating daily through exercise or a hot epsom salt bath helps prime the immune system through increased circulation and detoxification. 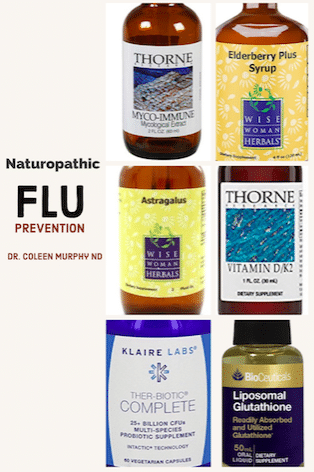 The below Naturopathic Flu Prevent Regiment is recommended for anyone who is looking to naturally boost their immune system. Any time you start or stop an herbal and/or nutraceutical regiment, please consult a health care professional, preferably a naturopathic doctor who understands and is trained in the use of herbal medicine. I start each morning with one probiotic pearl (freeze dried and shelf stable) as well as one refrigerated probiotic such as Klaire Labs or Integrative Therapeutics brand. Repeat before bed. Supplemenation is just that, a supplement, you still need to include fermented and probiotic foods like yogurt and pickles into your diet throughout the day. Water soluble vitamins like B and C vitamins should be dosed very high since any excess is excreted through urine though excess vit C can result in loose stools. Zinc as well as the fat soluble vitamins like A, D, E and K are stored in the fat, so dosing needs to account for the fact that you can take too much and overload your body. Another complicating factor is that these vitamins exist in the body in specific ratio’s to each other, such as the D3:K2 ratio. Yes, it’s complex, so unless you have a naturopathic doctor, stick to label recommendations for these vitamins for daily dosing, though larger doses can be therapeutic when prescribed in the proper ratio. All vitamins and micro-nutrients are important but B12 and D3 levels are critical to overall health including immunity, so you need to get these checked regularly through blood work and understand the risk factors of low micro-nutrient levels. Even sunny SoCal residents may still need Vit D3 supplementation, your D3 level is a basic tenet of health that you need to pay attention to. Vitamin C and Glutathione supplementation daily is absolutely critical for their powerful anti-oxidant and immune boosting action. An easy to take formulation, liposomal delivery of vitamins gets them directly into the blood stream rapidly while bypassing the GI tract. Glutathione helps prevent oxidative stress at the cellular level, it helps maintain the integrity of cell membranes, if you have stress, you need this supplement. Omega 3 EFA’s play a dual role to reduce inflammation and support the function of B cells and natural killer (NK) cells. A daily immune boosting tincture is needed, consider a blend of Astragalus, Elder Berry and Licorice as well as a mushroom tincture such as Thorne Myco-Immune. For those who don’t want an alcohol tincture or want a pre-blended formula, consider Wise Woman Immune Glycerite blend. Mushroom extracts show real immune modulating properties, they are anti-viral, anti-microbial and a true powerhouse of the natural world. Mycoimmune is well studied and well tolerated with proven immune boosting properties. Breakfast: incorporate garlic and healthy fats. Include stewed fruits and vegetables. Focus on high protein. Use honey or maple syrup to sweeten food and beverages. Lunch: Fermented and pickled foods, bone broth’s and/or shitake mushroom broth. Focus on equal amounts protein and complex carbohydrates. Cooked leafy greens finished with lemon juice. More garlic! Dinner: Garlic and ginger root heavy stir fry, coconut milk curries with turmeric, focus on complex carbohydrates from beta-carotene rich squash, carrots and sweet potatoes and lean protein. Dr. Coleen Murphy ND, LAc.